How did our analysts fare over another big weekend? The weekend has come and gone and our footy tips analysts took advantage of a string of close results and upsets across both codes. There were some good stories at the track as well, with Trevor Lawson’s free Quaddie racing tips getting up and paying a massive $3,600 in the process – that’s your Saturday drinks well and truly sorted! We start in South Australia where Aaron Barby tipped into races at both Morphettville (Saturday) and Port Augusta (Sunday). Betting into four races on Saturday things were looking very bleak after the first three before Sopressa ($5.50) saluted to almost get out of jail, taking the hit of a small loss on what certainly felt like a much tougher day overall. Things unfortunately failed to improve on Sunday, with no winners from two races at Port Augusta. Despite the results, all three selected runners were crunched in prior to the jump with Rugged Angel ($4.80 into $2.90), Letsava Win ($4.80 into $3.10) and Wrist Watch ($8 into $6, back out to $7.50) all having plenty of support from punters. The value was certainly there in each runner, but the performances simply were not. That will almost inevitably turn around in the long term. Bryan enjoyed some early success at Randwick on Saturday with Nic’s Vendetta ($6) giving members the dream start in the opening race. Things got even better in the fifth event as Moss Trip ($8) screamed home down the outside with a thunderous run to edge Dyslexic on the line. The winners dried up over the remaining six races that Bryan bet into for a break-even day. It’s a fine line between winning and losing in the horse racing game, with Miss Jenny running second at Kembla Grange for a big stake and what would have made it a big winning day for Bryan and his members. On Sunday it was a case of one hit, one kill at Goulburn as Cape Wickham ($2.50) dead-heated for first with Subban for a small winning day. It’s just another example of how fine the line really is, with members just a centimetre away from multiplying their collect by six. At Caulfield, Trevor Lawson stayed out of most of the day, betting into just one race for Trev’s Bets members for a small loss. It proved the way to go with a number of upsets as short favourites struggled to do as they were expected throughout the meeting. Later in the day, Melbourne Ratings members were tipped into the final two races by Trev and enjoyed some success. Keen Array ($7) finished second in race 8 much to the dismay of members, before Fastnet Tempest ($10.20) beat home Rhythm To Spare ($26) in the last of the day in an easy watch for Trev and his members. While Rhythm To Spare getting up would have been the ideal result at huge odds, Fastnet Tempest saluting made for a small profit on the day. Across the ditch, Khimar War ($4.20) saluted in the second at Riccarton on Saturday with no joy in the fifth event a little later on as Chris acrrued a small loss for the day. Betting into one race on Sunday at Trentham, both Lodi ($2.10) and Charlie Horse ($23) looked like winners but could only finish 2nd and 3rd in a close-up finish for an agonisingly disappointing result. Dean the Trial Spy failed to find a winner in three races (two at Ascot and one at Randwick), but can count hismelf – and his members – unlucky after Bondi ($13/$3.90 each-way) and Sariska ($2) were both beaten narrowly in their respective races and First Strike ($8.50/$2.50 each-way) started slow out of the gates to finish fourth. The place price for Bondi was very nice indeed and was enough to break-even for the day despite the frustrating results. Mark Van Triet didn’t have much luck at Ascot either, betting into two races for no result. Media Baron ($12) ran third in race 8 and would have been a very nice collect had it managed to take the honours away from race favourite Action. The Key Bets enjoyed a strong Thursday leading into the weekend, going 3/3 for a $1000 profit, and Cameron O’Brien and his members were all set for a big weekend. It didn’t start all that well at Cranbourne with raging favourite Monkey Magic ($2) and Haylin Rouge ($4.30) both running third after some of the poorer riding efforts you’ll see from the men on board. Things didn’t start all that brightly on Saturday, either, with no luck early on at Randwick before Trapeze Artist ($2.30) got the ball rolling in the seventh of the day. Cameron soon found himself with another winner as Rich Charm ($2.20) found the line first at Caulfield, making for a small losing day with 2/7 runners home. Narrogin on Sunday saw three more bets from Cameron and Scandal Maker ($5.90) got things off to a ripping start with a solid victory making it a winning day for members after just one race. The only downside was that the runner drifted significantly from the $3.80 fixed taken earlier in the day.. but a win is a win is a win. SCANDAL MAKER for @ChampionBetsAU first of three #keybets tips today. I suggest they take $4.00 as it is first up and if it is right it'll be backed. It drifts out to $6.50 SP, so not backed first up... and wins anyway. #theydidntknow...? Unfortunately Let’s Twist ($4.50) was never in the race and Valderi Valdera ($3.90) was also disappointing to close out the weekend of racing. The Bulldogs and the Roosters got us started on Thursday night in the NRL this week in one of the most dour affairs you will ever watch. The game’s opening try was scored and converted by Latrell Mitchell after just three minutes… and that was followed by 77 minutes of nothing but bombed tries and errors as the final score remained 6-0 to the Roosters. Steve Green got his weekend off to a strong start with Canterbury somehow covering the +6.5 line despite failing to score, while a smaller head-to-head bet on the Dogs was a frustrating ride that ended in defeat. Brett’s NRL Specials started the weekend slowly with no score in the second half meaning that it couldn’t possibly be the highest scoring half, while Canterbury failed to stay within the +2.5 first half line as well. Onwards and upwards as they say, and Friday brought a double-header with the Dragons heading to New Zealand to tackle the Warriors before the Broncos welcomed the Storm. Steve stayed out of the first game as the Dragons suffered their first defeat of 2018 and brought the Futures bets back to the pack ever so slightly. It was a frustrating night for McGregor’s men with a couple of decisions not going their way as well as a bombed try with the line beckoning in the first half. Brett’s NRL Specials bounced back with a perfect game, winning on the Warriors at a very generous +3.5 second half line, while David Fusitu’a and Nene McDonald both went tryless with their ‘Most Tries’ matchup ending in a tie as predicted. Unfortunately the second clash didn’t yield the same results as the Storm scored two late tries to claim a 34-20 win. Both of Steve’s bets went down in flames, with the Broncos +4 and total score under 38.5 being dealt a savage blow after four tries were scored in the final quarter of the match – including three to the Storm. The barrage of late tries also meant that the highest scoring half was the second – not the first as predicted – and Corey Oates failed to score a try at anytime, leaving NRL Specials with a break even night across the two games. Things were a little better for Brett and his team in the AFL as Adelaide upset the Swans at the SCG by 10 points. The undermanned Crows were gritty and got the jump early on, easily covering the +12.5 first half line, while a bet on Rory Laird (under 31.5 disposals) looked in big trouble for most of the match. That is until Laird forgot how to find the footy late in the contest, finishing with 30 touches as AFL Specials members snatched victory from the jaws of defeat. With less games over the weekend due to ANZAC Day being next Wednesday, there was only one early game of AFL… and what a game it was! The Saints and the Giants played out a thrilling draw as Jake Carlisle dropped a mark he should have taken in the dying seconds to win the game for St Kilda. The Saints easily covered the +10.5 first half line while Jack Steven (over 27.5) found plenty of the ball to finish with 29 touches and make it 4/4 for AFL Specials on the weekend to date. What a thrilling finish at Etihad Stadium! Daniel and Stephen put their first bets down for the weekend as well, backing the Saints head-to-head and at the +19.5 match line – getting money back for the draw on the head-to-head result and starting the weekend off well. Things continued to motor along in the twilight contest as the Blues stuck with the more fancied Eagles for most of the night, eventually going down by 10 points in a vastly improved effort. Paddy Cripps (over 25.5) was enormous with 33 touches and Dom Sheed (under 24.5) was quiet with 19, keeping the perfect weekend in tact for AFL Specials, while Daniel and Stephen backed the underdog Blues head-to-head with a big play on a +32.5 line to continue their winning ways as well. Port Adelaide and Geelong played out a scrappy contest at night, with the gritty Cats running away with it in the second half to the tune of 34 points. That wasn’t what the AFL Tips boys wanted, with their biggest bet of the round on Port -13.5 falling well short. It was almost another perfect game for the AFL Specials, with Jared Polec (under 26.5) staying under his disposal line but after a low-scoring final term, two goals in the final two minutes from the Cats made the second half the highest scoring of the contest by 4 points and marking the first blemish on Brett’s AFL weekend. 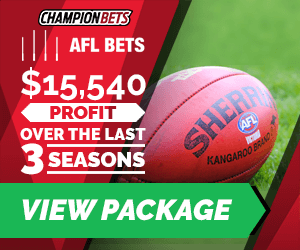 The same bet would lose in the Fremantle-Bulldogs matchup as the Dockers blew the Doggies away after halftime, leaving AFL Specials with a 7/9 record across the first five games of the round. It was better news for Daniel and Stephen, who got some of the Port losses back as the Dockers cruised past the -11.5 line to win by eight goals. In the NRL, Souths trounced Canberra 42-22 in a high scoring contest that heaped more pressure on Ricky Stuart. NRL Specials broke even taking Canberra at the first half line of +1.5 but then recovering with Souths -1.5 in the second half. Wests and Newcastle played out a thriller, with the Knights jumping out to a 10-0 halftime lead before 20 unanswered points from the Tigers saw them in the box seat with 20 minutes to play. The visitors were far from done, however, with two tries up their sleeve including the match-winner in the closing minutes to claim a 22-20 upset win. Steve and his members were left bitterly disappointed after taking the in-form Tigers head-to-head, while Brett’s members were left pleased after going 2/2 on Newcastle at a +3.5 line in the first half, as well as the second half to be the highest scoring of the match. North Queensland snagged a much-needed win at home with a 26-14 victory over fellow Queenslanders the Gold Coast. Steve got this one right, backing the Cowboys at a match line of -6.5 for a handy win, while Brett’s team struggled with two late tries to the Gold Coast seeing both bets go down (Gold Coast +3.5 in the first half and North Queensland -3.5 in the second). Things could not have gone better in the NRL on Sunday for both our analysts. Parramatta broke their 2018 duck with a thumping 44-10 win over Manly, with Brett’s two bets of Parra +1.5 in the first half and the second stanza to be the highest scoring of the match both getting home comfortably. 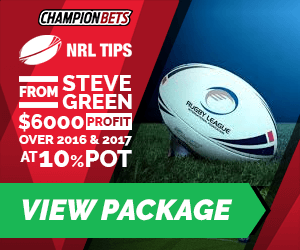 While Steve stayed out of that one, he did have a large play on Cronulla at very nice odds of $2.60, with the Sharks beating off the dogged Panthers 26-22 at Shark Park. The Panthers are a big danger to St George Illawarra for the Futures bets as well, which only made the win sweeter. 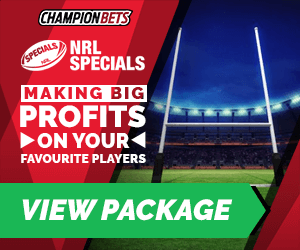 Bets on the first half to be under 19.5 points and the second half to be the higher scoring of the two both saluted for Brett’s NRL Specials members, making it a perfect day with 4/4 bets getting over the line. The AFL round doesn’t finish until Anzac Day on Wednesday but the weekend action finished up with two more matches on Sunday as North hosted the Hawks and Brisbane took on the Gold Coast in the Q Clash. At Etihad Stadium things started off brilliantly as Daniel and Stephen’s head-to-head bet on North at $2.60 and at the line of +12.5 were all-but home by halftime with the Roos in scintillating form and leading by 57 points. A late Hawks fightback was on but never really threatened the result itself as North cruised home by 28 points. Brett’s AFL Specials looked strong early with Ben Cunnington (over 23.5) and Shaun Higgins (over 24.5) leading the disposal count at quarter-time and for much of the second term. While Cunnington finished with 29 in a brilliant performance, Higgins’ afternoon was cut short when he was brutally knocked out early in the third quarter, making for a disappointing finish and a break-even on the game. The Q Clash was a thriller with Brisbane fighting back from a big deficit to fall just shy of victory. Cameron Rayner had a chance to level the scores in the dying seconds but could only manage a behind as the Suns held on for a five-point victory. The Lions and the Suns put on a classic finish! AFL Specials members broke even again with one from two winners home, as Jarryd Lyons (under 27.5) saluting and Dayne Beams (under 27.5) finishing with 28 touches to fall over the total in another agonisingly close call. 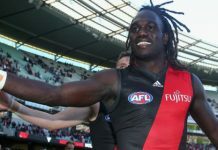 There are two more games in the AFL to come for round five as Melbourne tackle Richmond tonight before the traditional Collingwood and Essendon blockbuster on Anzac Day, while NRL round 8 kicks off with a double-header on Anzac Day as the Dragons battle the Roosters before the Storm welcome the Warriors to AAMI Park. You can join our footy analysts on their journey to profit in 2018 right now – don’t miss another minute of the action!